The existing complex of the Oude Dijk monastic community is not tailored to offer elderly care for the monastery’s aging population. 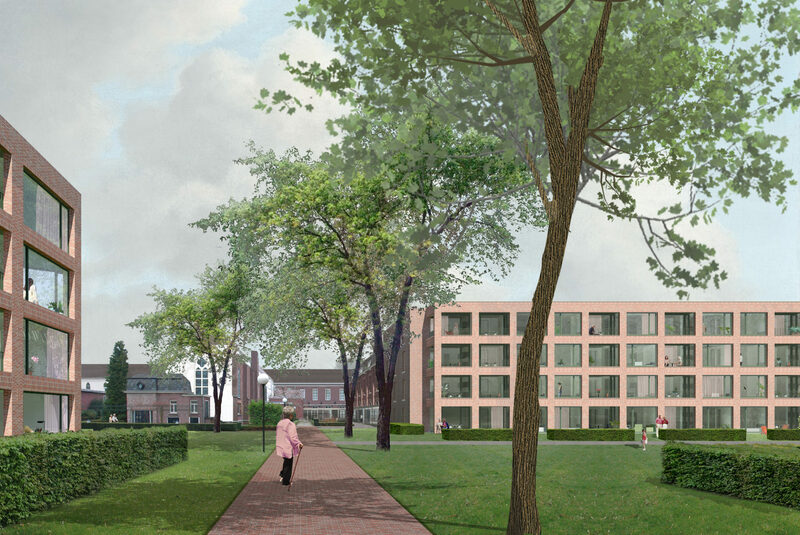 The assignment is to realize 100 elderly care apartments in the convent garden, while preserving the continuity and the exceptional green character of the garden. The convent of the Sisters of Charity in the centre of Tilburg is a unique ensemble formed by buildings and their adjacent outer spaces including the highly maintained garden. This large green oasis brings the much needed tranquility within the urban field. 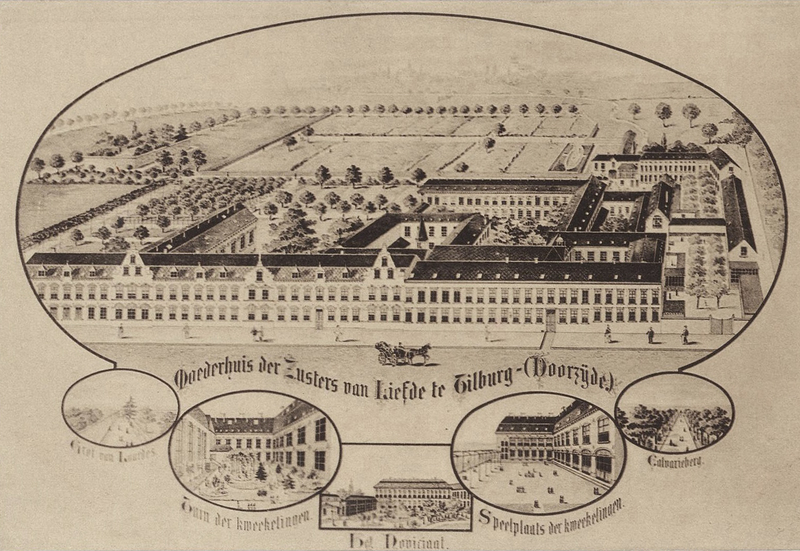 From the first establishment in 1832, the complex and its garden is undergoing a process of continuous spatial transformations following the changing needs of the sister community, with the last generation of buildings from the 1980ies. We see the current assignment as a logical next phase in this ongoing process. 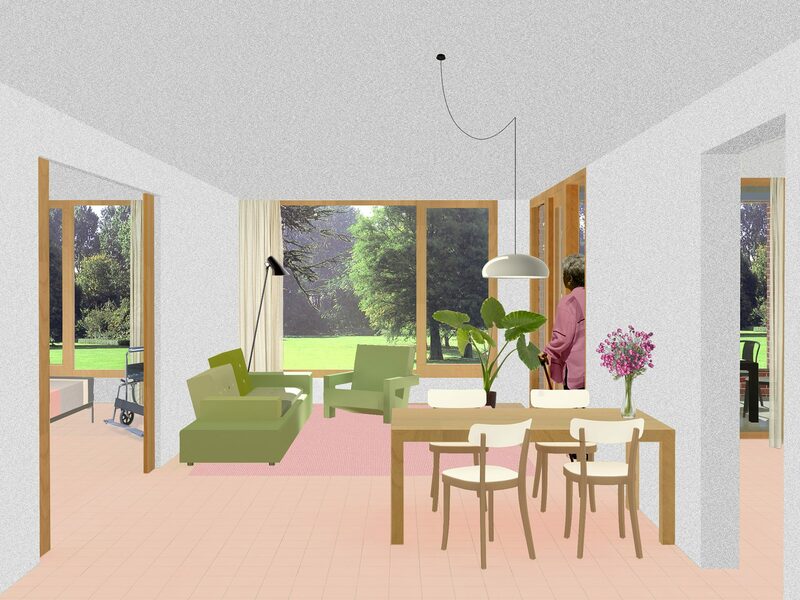 The challenge is to develop a spatial concept that answers the current (housing) need while anticipating the moment when the complex will be fully inhabited by laymen and the garden will be open to the public. Despite its central location, the complex has a limited physical relationship with the surrounding city, partly due to the intrinsic monastery function, but also to the fact that the city in its development has consistently turned its back to the monastery. 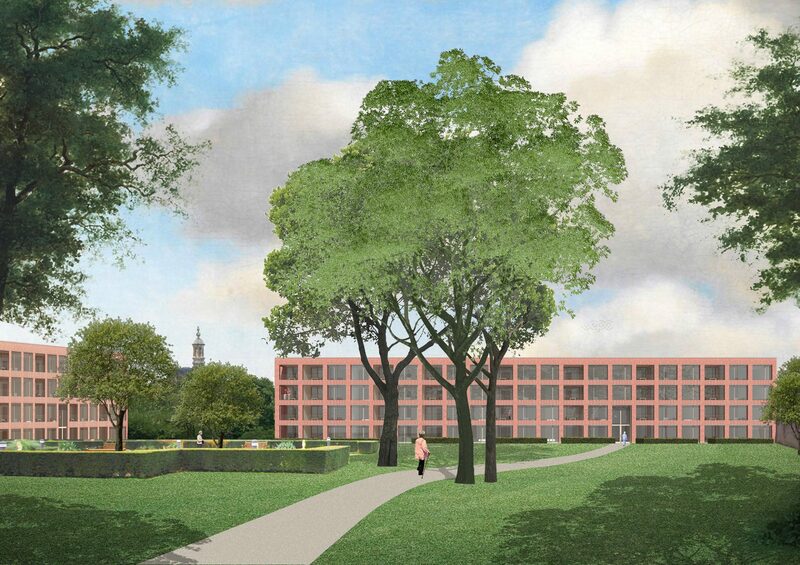 By selectively opening the complex in strategic places towards the surrounding public space, we see an opportunity to take the monastery complex out of its isolation without sacrificing the private monastic atmosphere. The starting point of the new design is the historical courtyard typology, present at several moments in the convent’s development. 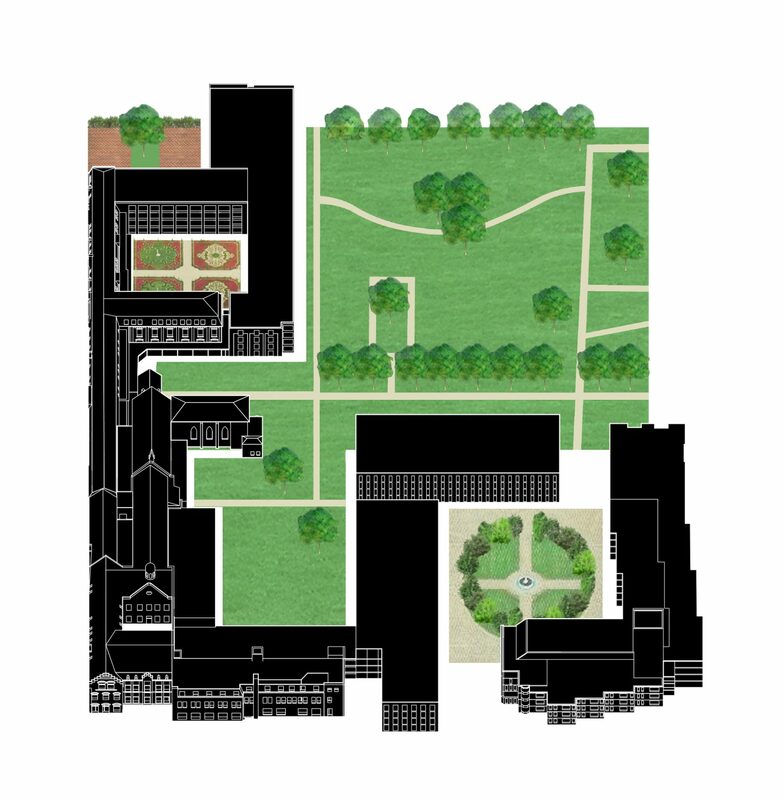 We propose three new courtyards at the edges of the convent’s garden, each with its own character and functionality. The new volumes forming the courtyards are not to be recognized as independent buildings, but rather as (decor) walls of the new (and existing) courtyards. They are subordinated to the overall figure of the ensemble by taking over the volume height and size of the existing. 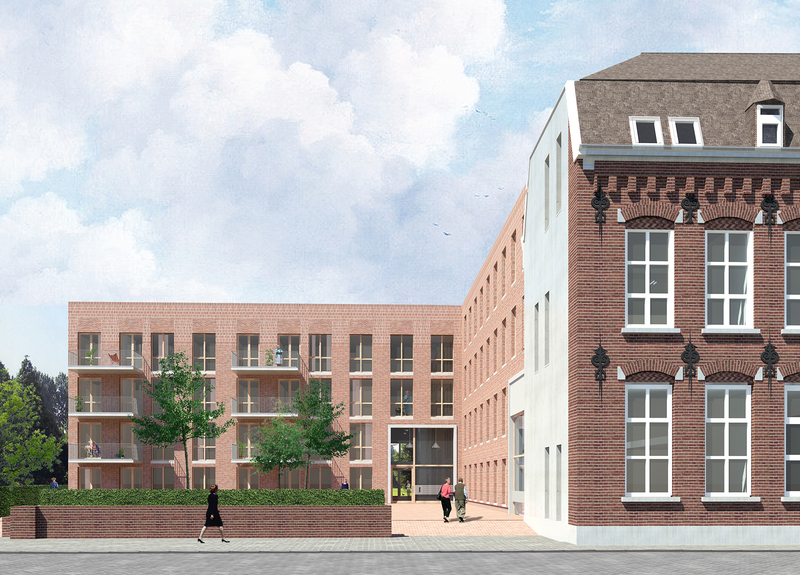 In a first phase, the monumental wing of the “Oude Ontmoetings Centrum” (transformed into housing with high care level for psycho-geriatric patients) and a new volume at its west side (with medium care apartments) define two new courtyards. A private, closed courtyard forms a secure outdoor area for the psycho-geriatric patients. An open, city-oriented courtyard serves as an entrance square for both buildings and creates a new formal entrance to the adjacent city park (once part of the monastery garden, at this moment poorly accessible). In the second phase, the outdated ’80ies central wing of the complex will be demolished. On its place, two new volumes, together with the western ’80ies wing, will define a new residential court. 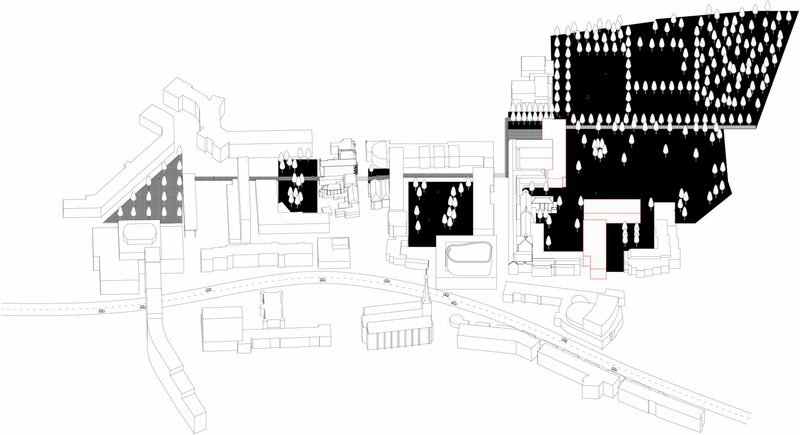 One of the new volumes sticks out through the current northern alignment of the complex, opening up the courtyard and announcing the presence of the complex towards the city centre. Perpendicular to it, the other new volume is positioned in such a way to create two openings towards the convent garden. 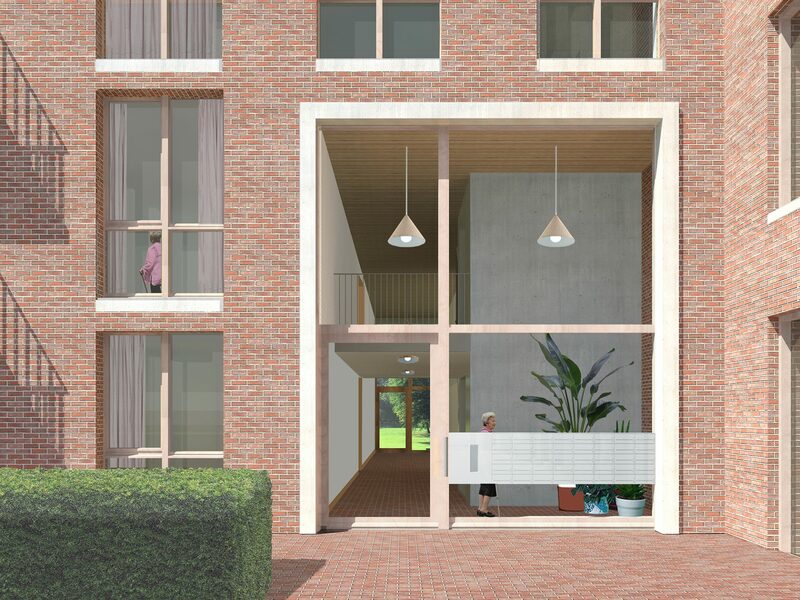 The new residential court acts as a stepping stone between the city and the convent garden, spatially regulating the limited opening of the garden. 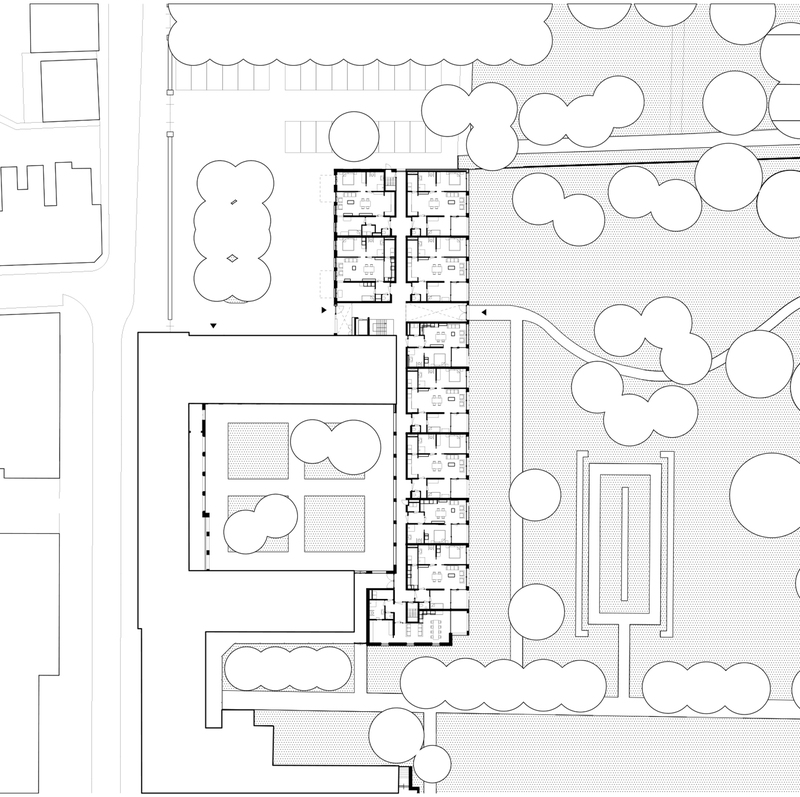 The materialization and façade design of the new volumes is derived from the urban concept of the courts, dictating the adjacent walls of a courtyard to have similar façades, and not the single volumes. This results in volumes with different “faces “, depending on the court they are oriented. When a façade is oriented to a monumental part of the monastery, the rhythm and proportion of the openings is adapted accordingly, when a façade is oriented to the garden, the design of the openings is more “free” and can therefore be maximized. These façade families along with the consistent use of a brick similar to that of the monument provide a sense of continuity in the overall ensemble between old and new. 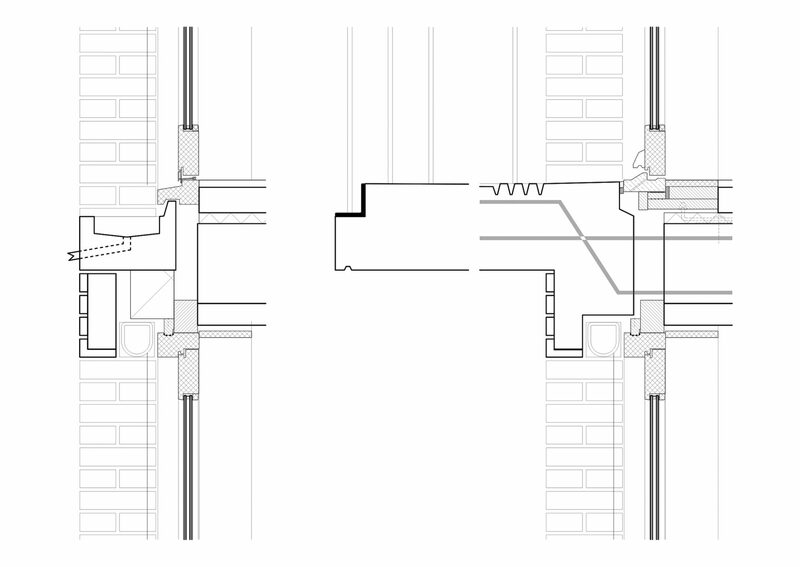 The flat detailing and the use of multiple bonds within the same plane create a contemporary look. 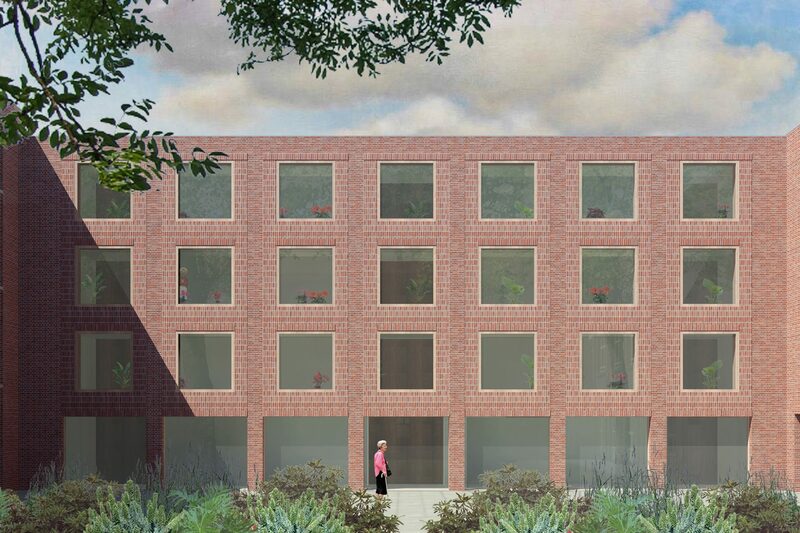 The new volume in the first phase has 4 floors, where the sisters will live in groups of 10 per floor. 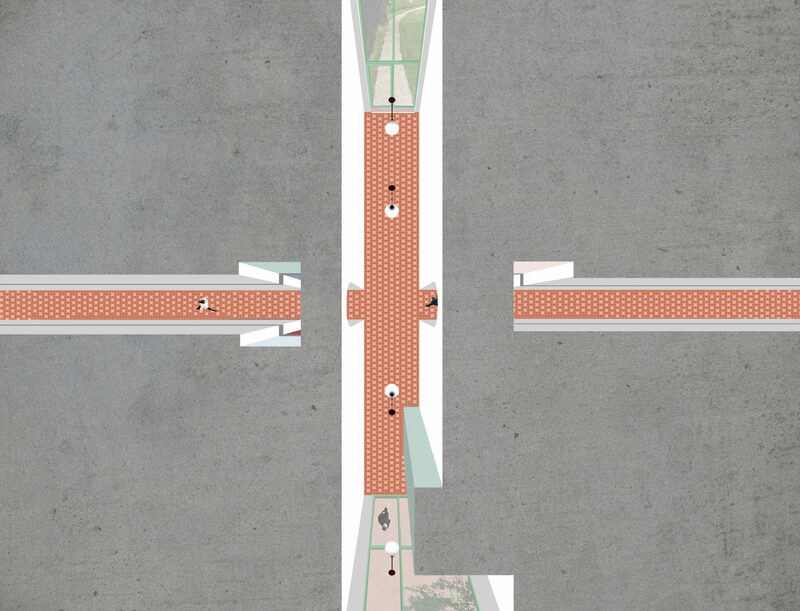 A transparent double-height entrance hall, placed in the corner of the entrance court, runs through until the garden and connects it visually with the city. 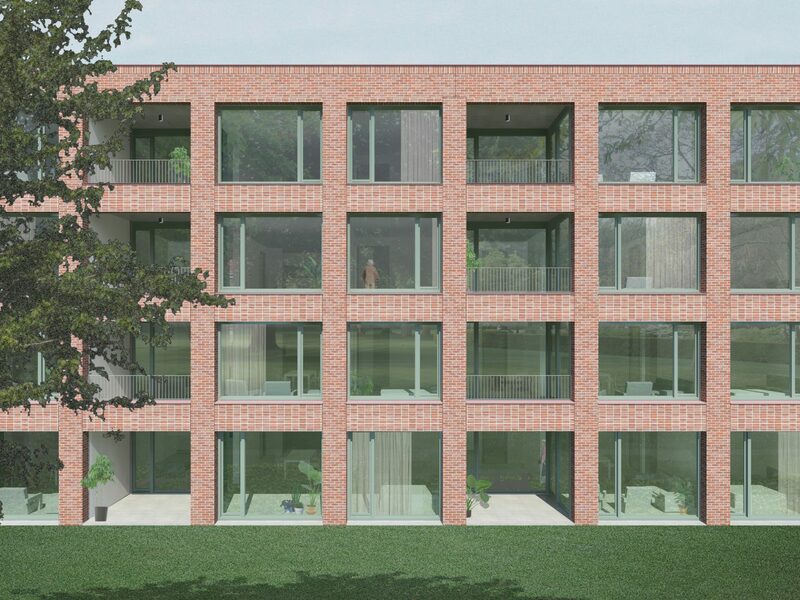 The apartments are ordered by a common corridor, with most(8) oriented towards the garden and two on the entrance court. 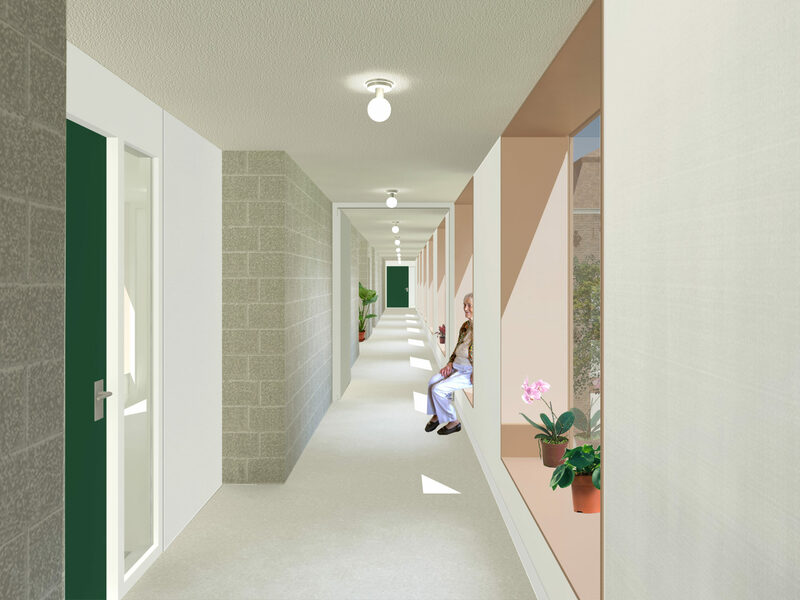 The corridor is generously lit via the closed courtyard and widens at the place of each apartment entrance. 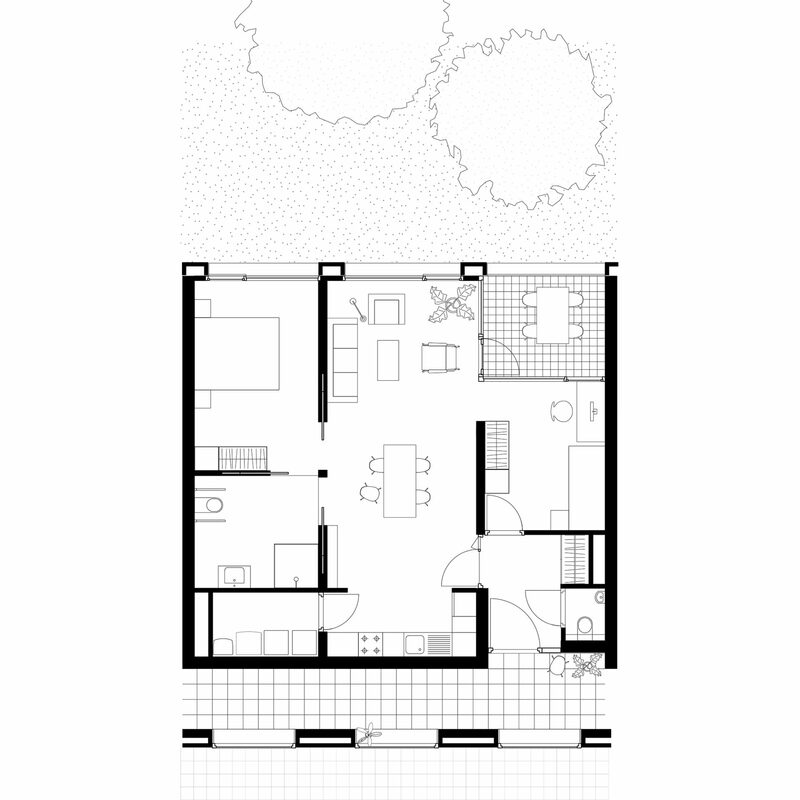 The relatively high surface requirements for care accessible housing combined with the desire to achieve a compact building has resulted in a particular typology of the apartments. These are made up of three naves, with the central nave functioning as both living room and connection between the other rooms.